Rubber pavers have become a popular choice in outdoor flooring because of their incredible absorptive qualities, eco-friendly design, and reliable traction. The wide array of color options available make it easy to find one that elevates the design of your outdoor space. Designed to look like brick or stone, these pavers add a layer of style to the hardscaped areas surrounding your home. Use them to cover an existing patio or create a safe play zone beneath a swing set or treehouse. With so many different styles and uses available, it is easy to find the ideal way to incorporate rubber patio pavers into your outdoor project. 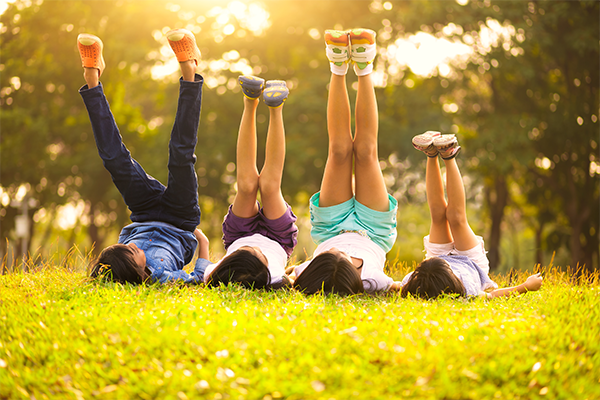 As children learn to walk and continue to play, trips and falls are bound to happen. Rubber tiles provide a layer of cushioning beneath the feet, making them a desirable choice for areas with children to run and play. The natural texture of the rubber provides a grip beneath their feet that help prevent slipping, even when the tiles are wet. These safety benefits have made them popular in back yards, around play structures. Even though they provide the benefits children need, they are not juvenile in design. 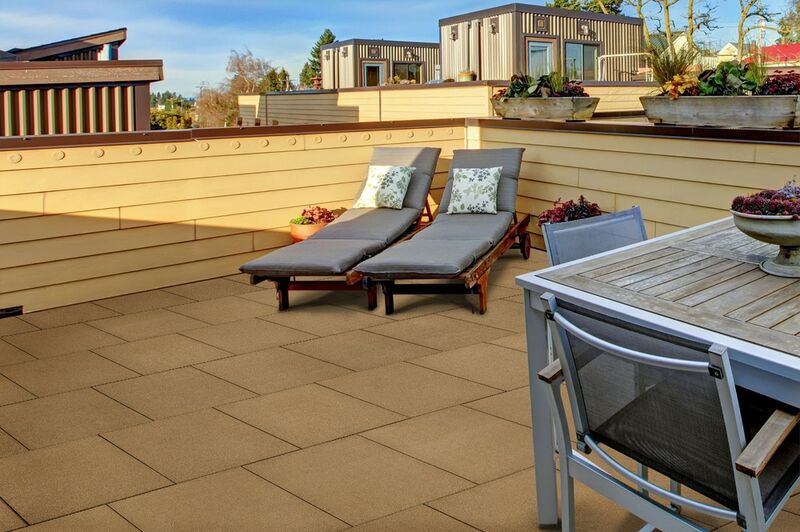 Rubber patio pavers are every bit as fashionable as traditional outdoor flooring options. Because they do not freeze, ice never forms on rubber pavers in the winter and any snow is quick to melt on this warmer surface. You don’t have to be a child to appreciate the same benefits. The natural give of rubber pavers makes them a great choice for high-impact activities because they help to reduce joint pain. They can even be used indoors to add a soft and strong surface to garage, workshop, or workout room floors. 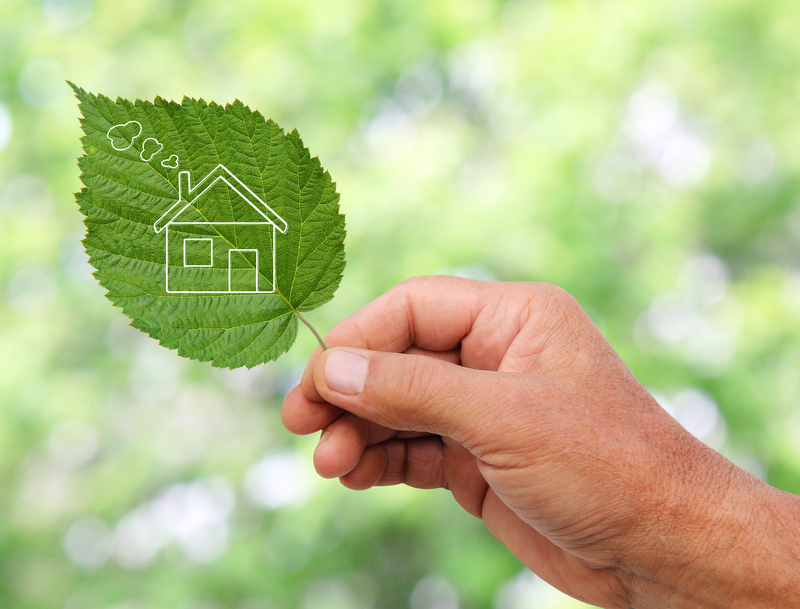 Today, the environmental friendliness of a product is a major consideration when making the final selections. 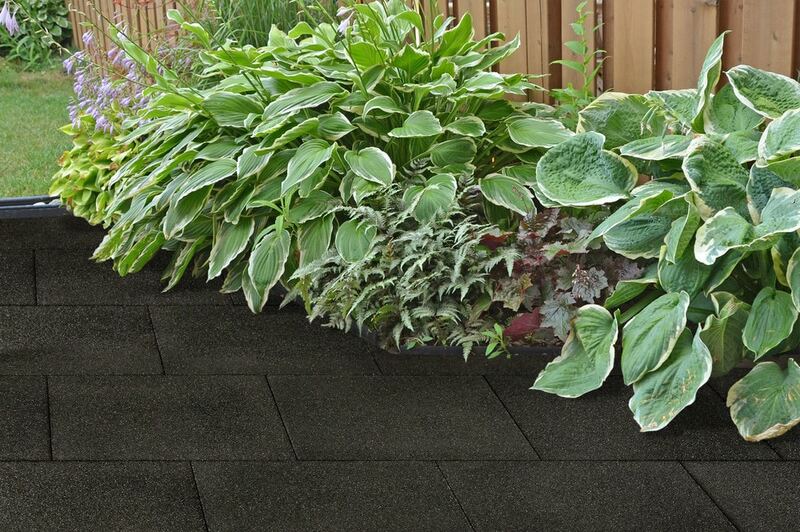 Rubber pavers are crafted of recycled tires and rubber materials, keeping these items out of landfills and giving them a new purpose as safe flooring for outdoor areas. With more than 304 million tires discarded annually, choosing a recycled product such as rubber tiles to hardscape your home is an earth-friendly choice. Polyurethane or other binding agents hold the rubber together, providing a lasting hold. Because the majority of the materials are recycled, these pavers also help to preserve other resources. When you’re looking for an outdoor flooring product designed to hold up to high traffic, rubber tiles make an exceptional choice. Rubber tiles are generally crack and chip resistant, even when exposed to harsh elements. If one does get damaged, it is easy to replace by lifting out the affected square and adding a new square in its place. The main drawback of rubber tiles is that they do have the tendency to fade with exposure to direct sunlight. This is more noticeable in the darker color options than with the lighter colors. The fading of the color in no way changes the structural integrity of the product. If an overhead canopy or covering is in place, it will go a long way toward reducing the fading of the rubber tiles. Once in place, rubber pavers are largely maintenance free. When they get dirty, sweep them or simply hose them off to rinse away dirt. The rubber won’t absorb moisture or bacteria, making them a hygienic choice as well. Under extremely hot conditions, it is possible to notice a rubber smell. Rubber tiles can provide the same functionality of brick and concrete while offering an array of added benefits. Rubber tiles are a lightweight material that is easy to work with. These tiles come in a wide assortment of sizes, including interlocking options that click together quickly and securely. Like brick and concrete, they can be used to establish a play area, create walkways, and cover patios. They can look like terracotta, natural stone, traditional brick, and more. Activity on brick or stone can be loud. 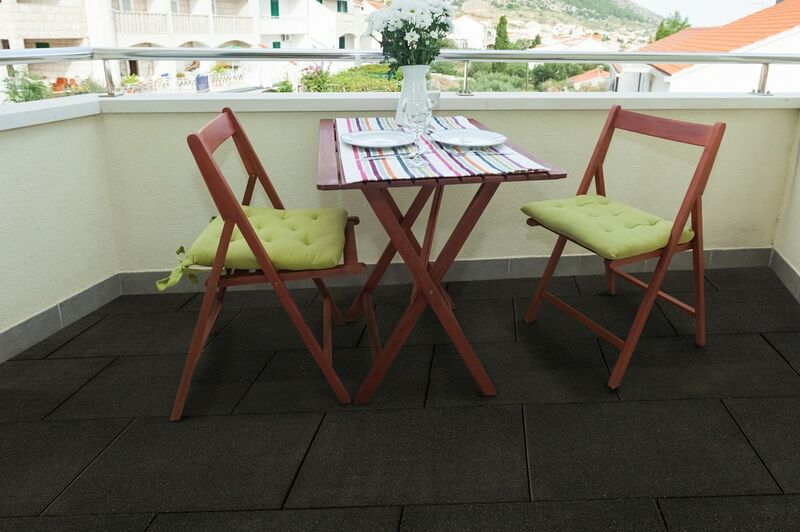 Rubber tiles absorb sound, helping to keep noise at a minimum when used in outdoor or indoor settings. They may offer a similar look to brick and concrete but the installation process of rubber pavers is actually much simpler. Install them directly over an existing flooring, such as a concrete slab, or lay a foundation of crushed stone as the base. There’s no need to call in a professional to complete the simple process of installing rubber tiles or pavers. If you are worried about any of the chemicals from the pavers leeching into the soil, you may want to make sure that plants are not planted directly along the border of the pavers. A floor lays a foundation for the style and function of a space. Make your deck, patio, or outdoor play area a comfortable, inviting, and fashionable area by using rubber patio tiles to define the space. Not only are they crafted of recycled materials for an environmentally friendly choice, but they are also much easier to install than traditional brick or stone alternatives. If you want to keep the eco-friendly design going, try using rubber mulch to give a fresh look and weed-fighting layer of insulation to your flower beds and gardens. Once installed, this durable and safe product will add style to your space for many years to come.